It will be a 23-hour train ride from North Korea’s capital, Pyongyang to China’s capital, Beijing: that’s 4,457 km kilometers in between the two capitals. I was so excited. When my tour company asked me, which mode of transportation I prefer in coming back to Beijing, train or plane. I immediately answered, “train”. That was a no-brainer. Trains are my favorite way to travel. I take the train as much as possible. Huge windows, endless scenery, you can walk, there are toilets, restaurant, and an opportunity to interact with locals and other travelers. 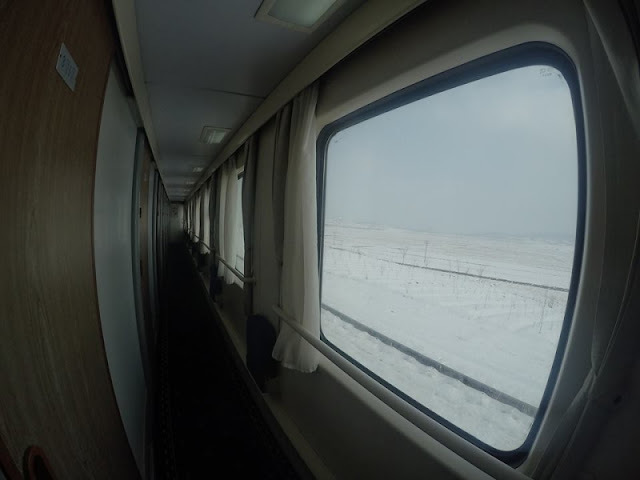 And, for this train, it’s a sleeper train, which means I get to have my own bed while cruising through the snow covered, isolated land between North Korea and China. Plus, I already took the plane in coming to North Korea. The Russian-made Air Koryo. So taking the train coming back means I get to experience both. The exterior of the train looks nice. A classic Chinese, communist-y, elegant-looking train. After bidding good-bye to our guide, Miss Pak, I went straight to my cabin. A soft sleeper compartment. I shared the cabin with 3 people. One was my Swiss roommate in Pyongyang, the other, an 80-year old Vietnamese-Canadian hippie who has been to over 100 countries, and the last one was a student from Netherlands. We were sharing our North Korean experiences with each other. Talking, chatting, having our thoughts, insights, about our just concluded awesome experience for a lifetime. Oh how we envied the Dutch guy who was able to experience a North Korean shooting range. All three of us were in the same tour company, Koryo Tours, while this guy went with a different agency based in Netherlands. As the train started to depart, we went out of our cabin, stood in the hallway to have a better view, and to socialize with other passengers. We saw our tour leader talking, surrounded by a bunch of passengers. We came closer to join in the conversation, because what he was saying looked important. *What he was saying was, there was one tourist, an American, who got held at the airport. “He is from another tour company, Young Pioneer Tours”. He said. Although a different tour company from ours, Young Pioneer Tours had exactly the same itinerary as ours. Even the same tour name: New Year’s Eve Tour. We were housed in the same hotel, as well. The Yanggakdo Hotel. We ate breakfast with them, saw them in the hotel’s lobby, elevator, entertainment area, and frequently saw them and their bus at the sites we visited. We wondered who this guy was and what he did. 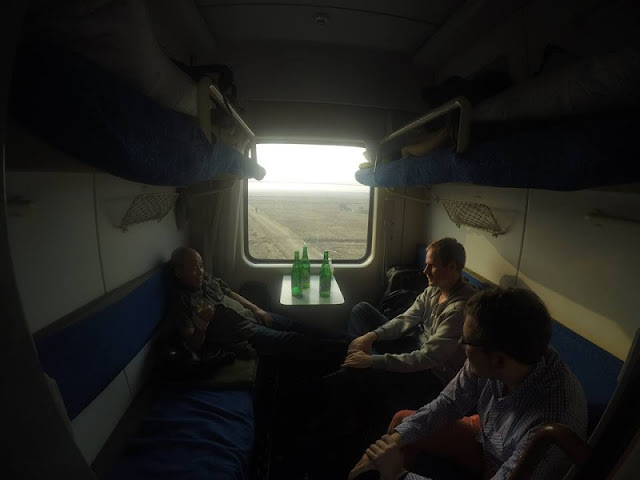 We enjoyed the view of Pyongyang from the train as it was slowly gaining speed. It was a good opportunity to see Pyongyang’s outskirts. Soviet-style apartments, people on bicycles. Not much vehicles. We went back to our cabin, still chatting while enjoying the view of North Korea’s countryside. Saw some villages, snow-covered fields, military check-points. The snow added to the beauty of the landscape. 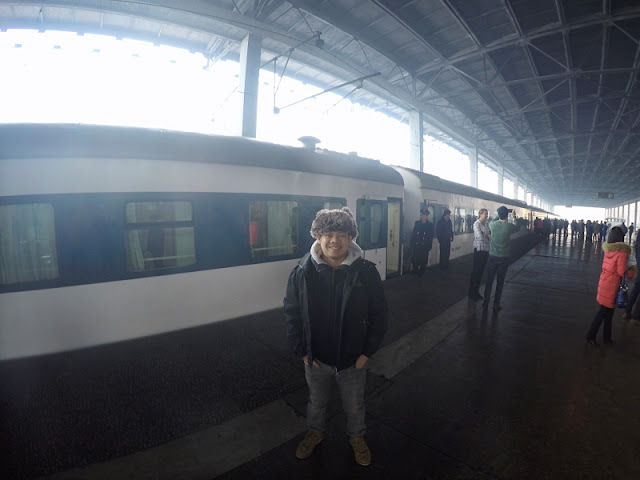 It’s exhilarating experience just being able to see North Korea through a train’s window. We had some stops at certain stations, too. Saw some trains carrying sacks of grains. Reminded me of gulag times during the Soviet-era. 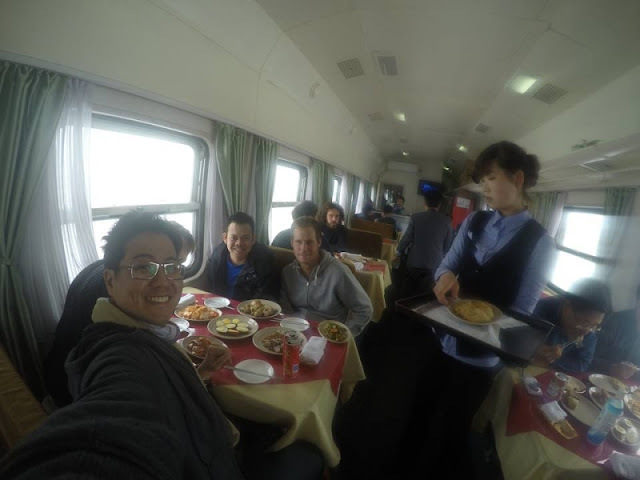 At the about noon time, our tour leader approached our cabin saying that lunch is now served at the restaurant car. The restaurant car connected is from North Korea, which will later be changed into the Chinese one, once we cross the border. This is a good opportunity to have our last authentic North Korean dish. We were joined by other people in that restaurant car. The Kiwi brothers and one Hong Kongese-Canadian, who are also part of our tour company. Food was good and filling… well, except for that raw river fish covered in chilli sauce, which they said, is a North Korean delicacy. I didn’t touch it. I also met the Young Pioneer Tours tour leader from Australia; also the administrator of the company’s Instagram-in that restaurant car. Chatted with him for a bit. The North Korean landscape was wide and empty. Hectares and hectares of farm land, lightly covered by snow, broken occasionally by villages composed of uniform houses, reminding me that we are in a real, pure socialist country. The TV in the restaurant car kept on playing concerts of the Moranbong band. Those singers with beautiful faces in traditional Korean costume and smart, crisp, military-like attire was refreshing and relaxing to behold. You got to appreciate beauty. At late afternoon, when the sun was about to set, we reached the border city of Sinuiju. It is separated to Dandong, China by the Yalu river, which acts as the border between the two countries. The train stopped for inspection. North Korean armies were everywhere. We were told by our tour leader to just stay in our cabin and just be calm and cooperative. There was a feeling of tension in the air. The soldiers came in our cabin. They asked for our cameras and phones. Checked the photos a bit. These are the kind of soldiers we usually just see in the news. You know, North Korean soldiers in smart, crisp, communist-esque military uniform, coupled with a don’t-mess-with-me face. And now, they’re sitting next to me, on my roommate’s bed. They checked my passport. “Ah, Philippine”, probably thinking, ‘You sent troops during the Korean War’. 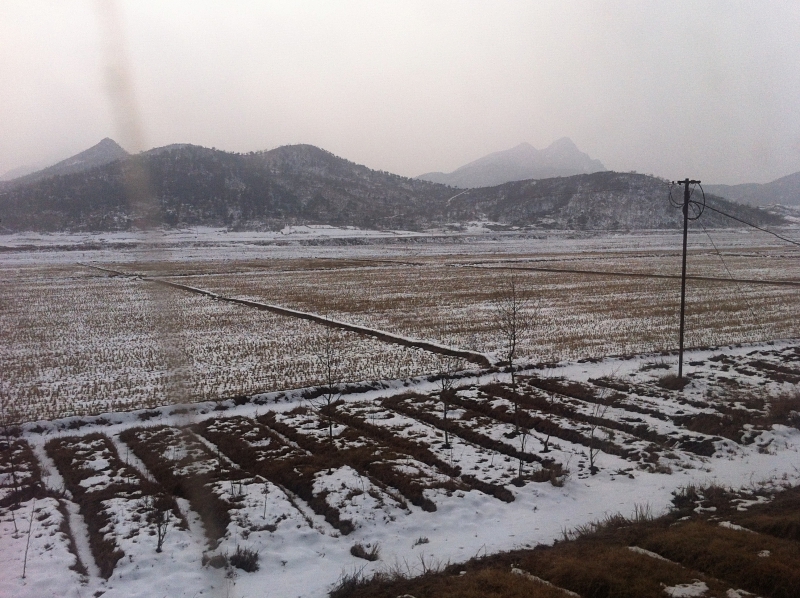 After the inspection, I went out of the train to just have a breath of fresh North Korean winter air. Mosaics and posters were everywhere. About the revolution, love for the country, and their leaders. The train left Sinuiju when it was already dark. With its new restarant car attached to it (now the Chinese restaurant car), it cruised once again, slowly gaining speed, fully confident that it will reach its destination safely and on time. When we were on the bridge crossing the Yalu river, we can already see Dandong. The contrast was really shocking. It’s like crossing a different planet. There was a huge difference between the two cities. Especially to think that they are basically the same, geographically speaking, separated only by a river. Sinuiju was dark; really dark. And it was mostly composed of apartment blocks while Dandong was so bright: full of lights, neon signs, business establishments. That moment was really shocking. A moment I can’t forget. I’ve been to lots of border crossings before. Thailand-Cambodia, Thailand-Laos, Cambodia-Vietnam, Germany-France, Norway-Denmark, Norway-Sweden, Germany-Norway; and have seen the Thailand-Laos-Myanmar Golden Triangle. They all looked very similar on the border area. I mean, you don’t really see an abrupt change in appearance upon reaching the other side. Suddenly everything just changed. In under a minute, everything around us changed. There were now more shops, more cars: a sudden change in the appearance of infrastructures. As the train cruised across China’s countryside, we continued on with our conversation in our cabin. Having interaction with fellow travelers-people from other parts of the world-is so refreshing and mind-opening. You learn a lot of things and have an opportunity to share your stories, too. 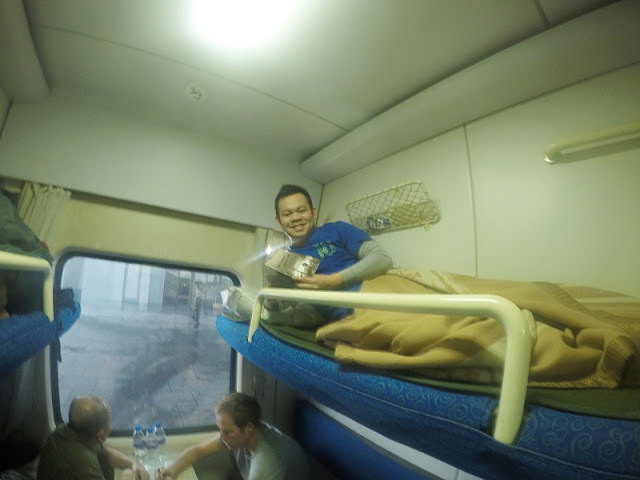 The soft-sleeper cabin was so comfortable. The train was not very shaky and bumpy, too. As I was lying on my bed, upper berth, I turned on my reading light to read the book I bought in Pyongyang entitled, Korea's Division and It's Truth, before sleeping-occasionally glancing at the window to have a glimpse of China at night. After a comfortable sleep, we arrived in Beijing train station in the morning. And once again, surrounded by lots of people and cars. I kind of missed the wonderful, organised city of Pyongyang where bicycles and trams rule the streets and pretty ladies make sure the traffic goes well in the absence of traffic lights. *When back in Beijing, I read from Yahoo news that the American tourist held at Kim Il Sung airport-on the day we departed Pyongyang-was Otto Warmbier. He passed away on June 19, 2017.
i always enjoy reading your blog...what you are doing now, once was my dream. I still like travelling but this time with my family in tow, it's almost next to impossible. Hi ate Ainor, thanks for dropping by. It's an honor that someone whose singing voice I admire so much is commenting on my blog. We used to have your cassette tapes at home. It's actually very fulfilling to travel with family.